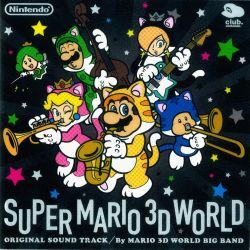 Released on Club Nintendo Japan for 500 points (250 for those who bought and registered Super Mario 3D World before January 31, 2014). Released on Club Nintendo Europe for 3000 Stars (2000 for Australia and New Zealand) on April 10, 2014. ** Reused from New Super Mario Bros.
English and Spanish translations are based on the game's stages as in the American version.